After Arizona Senator Jeff Flake announced he was not running for reelection to the U.S. Senate, three prominent candidates entered the race. One is conservative Kelli Ward, a former state legislator who ran unsuccessfully for Senate against John McCain. A second candidate is former Sheriff Joe Arpaio, who many do not believe is a serious candidate at age 86. 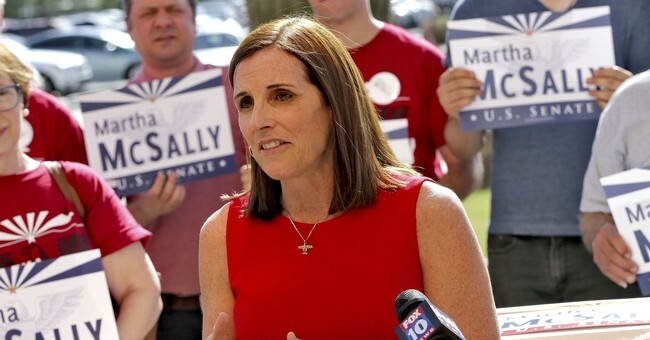 The third well-known candidate in the race is Rep. Martha McSally, a liberal Republican who represents a Democratic leaning district in Arizona. The Arizona Daily Independent reports that John McCain is pushing her candidacy. Arizona conservatives are tired of liberal Republicans representing them in the Senate. The state is still fairly conservative, unlike a state such as Maine which has liberal Republican Senator Susan Collins. Arizona would be better represented by a solid conservative. The winner will face Democratic Rep. Kyrsten Sinema in the general election. The Arizona Federation of Taxpayers awarded Sinema the Vladimir I. Lenin award a few years ago for being the most far left legislator in the Arizona legislature. The American Conservative Union gave her voting record in Congress a dismal 13.04 rating. She is running her campaign to the right, however, pretending to be a conservative in flashy TV ads. It will be a close race, and at least one poll shows Ward can beat Sinema. But unless Arpaio drops out of the race, Arizona looks headed to elect another liberal U.S. Senator.